Adil takes a long bamboo stick to nudge three pigeons into the sky. The little one, reluctant at first, refuses to budge. But then it is prodded into taking flight and disappears into the cloudy sky. Zahoor argues that Adil took too long to push them otherwise the infant would have landed in the coop. “All four birds will return together in less than 30 minutes,” he boasts as we sit near the three-tier coop. 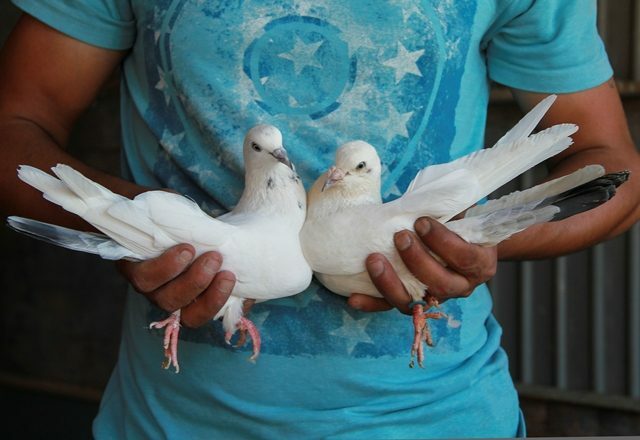 Zahoor, 37, and Adil, 34, both rickshaw drivers, have been pigeon fanciers since their teenage days. 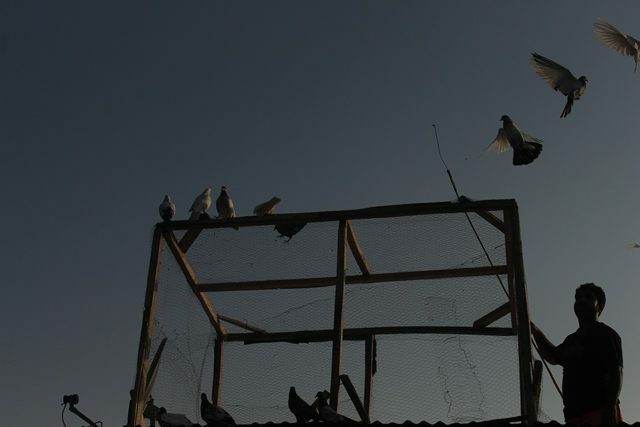 They would fly pigeons from their home on the bank of the river Jhelum in Nawakadal, Srinagar, the summer capital of Indian-Administered Kashmir. The lower party of the coop is divided into two sections: a cage and a breeding room. They second layer has an open space where a large helping of maize, corn, grain and a pot filled with water is stored. The upper section consists of four vertical and four horizontal bamboo sticks where baby pigeons perch and practice flight. The romance with pigeons perhaps runs in their blood. 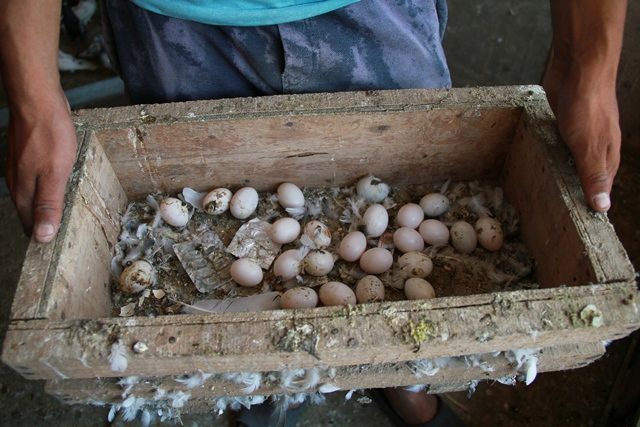 Zahoor says that his father, Mohammad Sultan, had given up his hobby of pigeon keeping by selling all of the birds to one of his relatives who belonged to Islamabad. One June morning in 1998, Zahoor was looking out the window when he noticed a snow-white and grey-necked pigeon resting on a neighbour’s roof. “It was a casual look and I just closed the window. In the afternoon my brother re-opened the window and the pigeon was still there looking at our house,” he recalls. 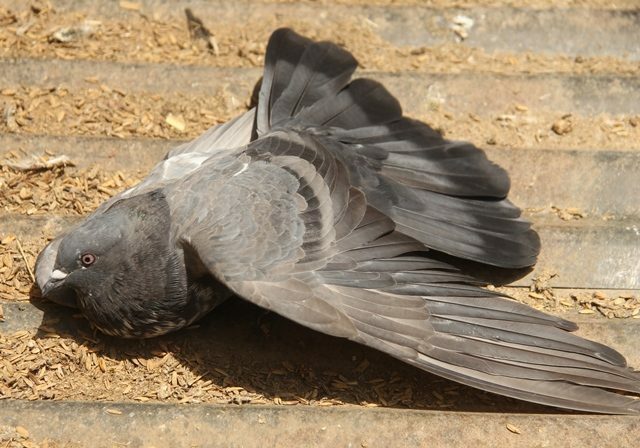 Adil told his father that the pigeon had been looking at their house since morning. Yahoo had grey feathers and muffed legs. “Yahoo earned this name because of its unique vocalization which sounds like ‘Ya-Hoo’. People then believed that Yahoo’s vocalization was a divine recitation for remembering God,” says Zareef. Pigeon-keeping slowly became popular across society. Poorer people pitched coops on their rooftops and actually became competitive. 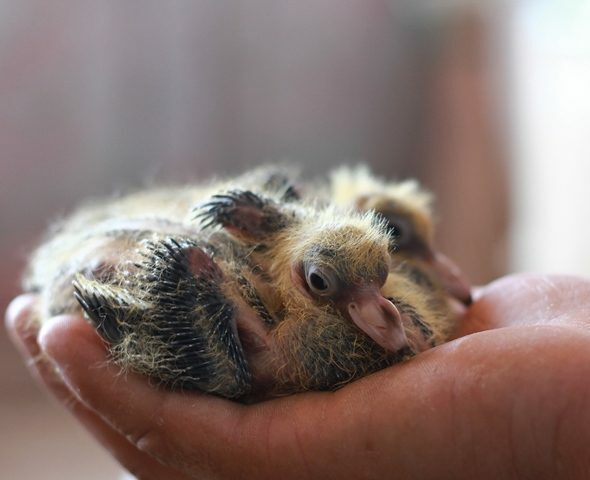 “Once pigeon fanciers got involved in events like pigeon racing, people began to see them in a negative light,” says Zareef. When affluent families used to tame pigeons, they restricted it to mare feeding pigeons and looked down on anything more. It is difficult to say exactly how many people have this hobby but generally there are about one or two in every neighbourhood. Sometimes people look down on it and some people even go so far as to say that families associated with pigeon fancying find it difficult to find a match for their children. 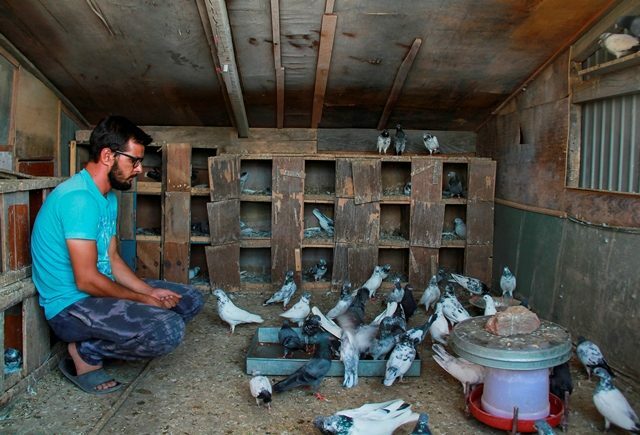 Mohammad Haroon, 55, one of the oldest pigeon fanciers in Batamaloo, Srinagar, says people from different communities have been maintaining a distance from them since the beginning. “What’s wrong with being a pigeon fancier?” he says. “Is it immoral or illegal, I wonder? It’s simply a hobby that these self-proclaimed civilised people don’t understand.” Haroon is a retired government employee. 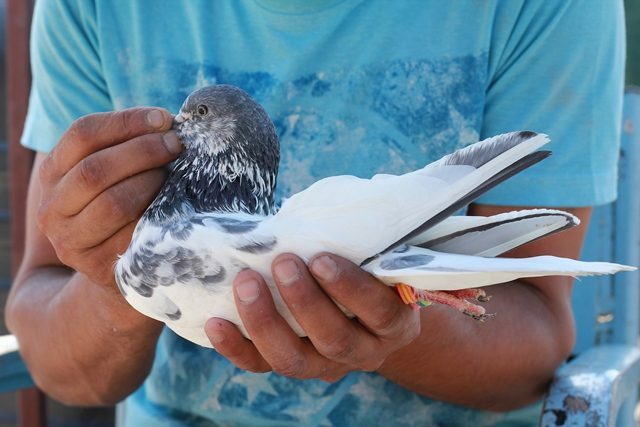 A 22-year-old pigeon fancier, Suhail Ahmad, believes pigeons have some spirituality that they infuse in us to separate us from getting involved in bad habits. Suhail is resident of Aanchar, a hub of pigeon fanciers. “Pigeons came to my rescue by ridding me of cigarette smoking and taking drugs that I had started after a breakup,” he confesses. Suhail’s mother, Haja Begum, agrees and adds that Suhail once even jeopardised his own life to save his pigeons in a devastating fire that engulfed eight structures in the congested neighbourhood. In January, earlier this year, flames erupted from a neighbour’s two-storey house. “By the time he [Suhail] returned, our house had caught the fire,” she says. “That day we felt that Suhail would die but due to God’s grace he not only came back alive but managed to save around 200 pigeons.” Suhail did not eat for four days because 35 of them could not be saved. He was hospitalised on the fifth day when he collapsed. One of the advantages of keeping pigeons is financial with several tournaments in June and July. 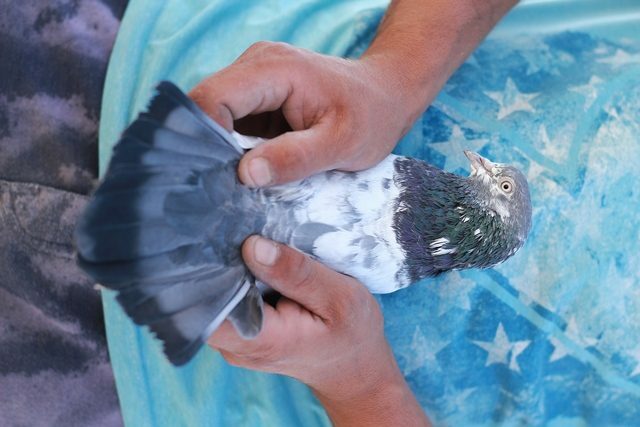 Each person flies five of their pigeons, and whosoever’s pigeon flies for the longest time can win up to $4500. This kind of thing that sustain a family, says Zahoor. For example, life, trade and jobs came to a standstill in 2016 when a curfew was imposed after outbreaks of protests and violence in Kashmir over the killing of Burhan Muzaffar Wani.